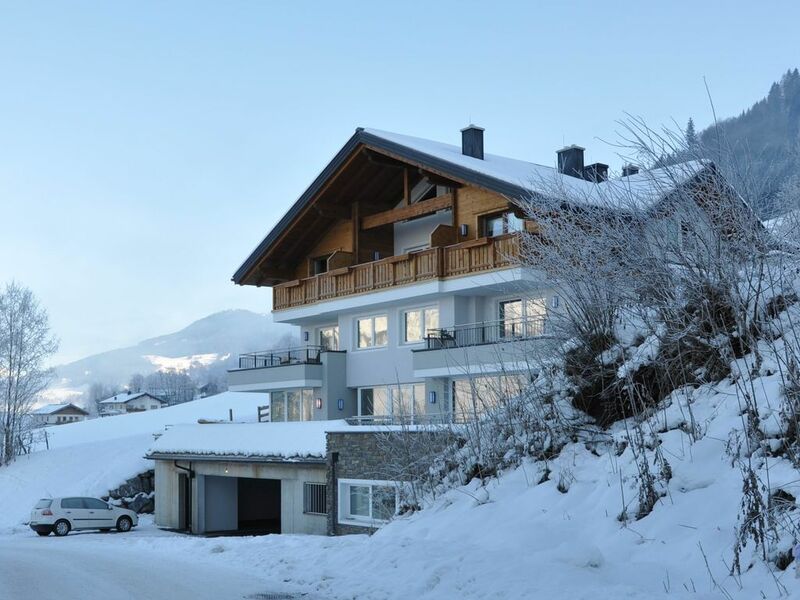 The apartment Oberalpendorf is located in a new, modern, typically Austrian country house in St. Johann / Alpendorf in the ski area Snow Space Salzburg with the ski areas Alpendorf, Wagrain, Flachau, Gastein, Bad Gastein and many more. The apartment has 2 bedrooms, living / dining room, an open kitchen with bar and bathroom / WC, all distributed over spacious 76sqm with parquet and tiled floors. In the house there is a common wellness area with sauna and steam bath. In both bedrooms there is a double bed (2 + 2). A baby cot is available in the apartment. The linen is provided. The bathroom has a separate shower and bath and the toilet is separate. The towels are provided. The kitchen is fully equipped with dishes, ceramic hob, dishwasher, refrigerator, microwave, coffee maker, toaster, fondue set, kettle, etc. The living / dining room has a large dining table, sofa set, TV with DVD and cable connection. Free Wifi in the apartment available. In the house there is a common wellness area with Finnish sauna, Turkish steam bath, rain shower and a relaxation area. The sauna and the steam bath are coin operated. Storage for skis and ski boot dryer are available in the house. The apartment has a parking space in the garage with direct access to the apartment. The apartment has a terrace with wonderful views of the surrounding mountain landscape. The apartment is a non smoking apartment and pets are not allowed. Ski schools and ski rental directly at the cable station or at the top of the gondola. Restaurants and apres-ski in walking distance. Small savings business for their purchases in, bigger supermarkets in St. Johann. Bus in the place about 100m. Wir - Familie mit 2 Teenagern - hatten einen sehr schönen Aufenthalt in St. Johann. Die Wohnung ist sehr gut ausgestattet und ist sehr nahe zur Skipiste gelegen. Man konnte direkt vom Haus ab- und abfahren. Der Wellnessbereich mit Sauna und Dampfbad hat das abendliche Audwärmen sehr beschleunigt. Wir waren rundum zufrieden. Dejlig ferielejlighed, tæt på lifterne. God plads til 4 personer. Die Wohnung ist liebevoll mit allem was zum Wohlfühlen nötig ist, auf einem sehr hohen Niveau eingerichtet. Die Wege zum Lift und zu den Restaurants sind kurz. Ein rundum perfekter Aufenthalt! Es un lugar perfecto para pasar unas vacaciones tranquilas. si vuelvo por la zona seguro que repetimos la instancia. Ankunft ab 16.00, Abreise bis 10.00. Nutzung der Wohnung ist nur für die vereinbarte Anzahl an Personen erlaubt. Es gelten die Allgemeinen Geschäftsbedingungen der Österreichischen Wirtschaftskammer.